Weddings are a glorious occasion! At Gloria Ferrer winery they most certainly are always. In the picture above you can see just how fun they can be. 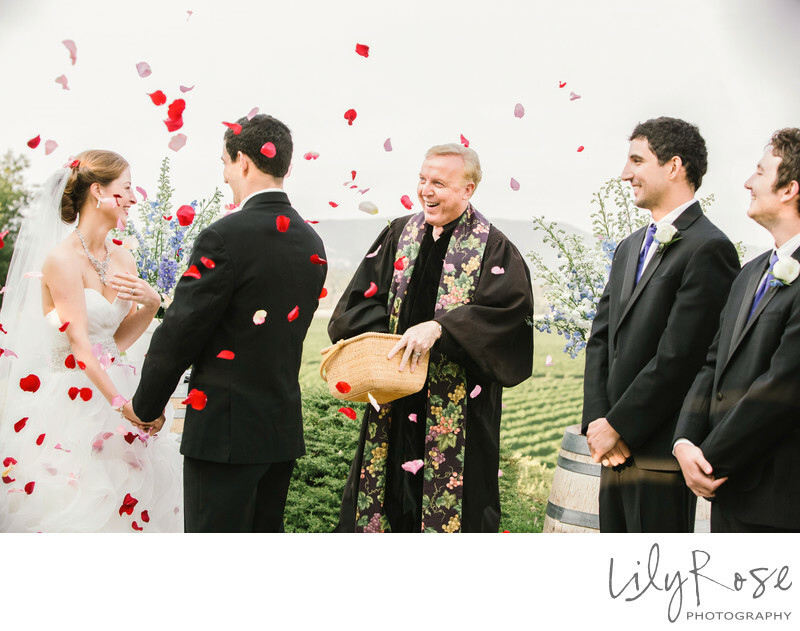 In this wedding the ceremony draws to an end with a shower of rose petals floating down. Everyone is caught in the emotion of the moment. It's these wonderful happenings as a photographer that we do our best to capture. It's these moments that brides and grooms will remember for the rest of their lives together. While it's said that a picture is worth a thousand words, I believe that an image like this might be worth even more. The surprise of the bride shows clearly as the minister, Rev. Blane W. Ellsworth, showers the couple with rose petals. It's wonderful to see everyone caught up in the moment. Location: 23555 Hwy 121. Sonoma, California 95476.